Generic Zaditen (Ketasma tablets) are used for the preventive treatment of bronchial asthma especially when associated with atopic symptoms. Ketotifen is a medication that is used for preventive treatment and has to be used on a continuous basis and is not effective in the acute prevention or treatment of acute asthma attacks. Ketotifen belongs to the classes of medicines called antiallergics and asthma prophylactics. Generic Zaditen is not effective in stopping established attacks of asthma. Ketasma is not a substitute for corticosteroid treatment (inhaled or systemic) when corticosteroid is indicated in the treatment of asthma. Ketotifen Tablets are also used for the prevention and treatment of multisystem allergic disorders eg, chronic urticaria, atopic dermatitis, allergic rhinitis and conjunctivitis. Ketasma tablets are manufactured by Sun Pharmaceutical Industries Ltd. in the strengths of 1 mg.
We also have in stock Generic Flonase Nasal Spray (Flomist Aqueous Nasal Spray) which is used to treat nasal symptoms of seasonal and perennial allergic and nonallergic rhinitis in adults adolescents, and pediatric patients 4 years of age and older. 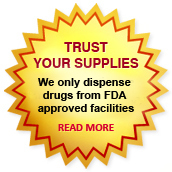 We supply original Ketasma tablets manufactured by Sun Pharmaceutical Industries Ltd. . 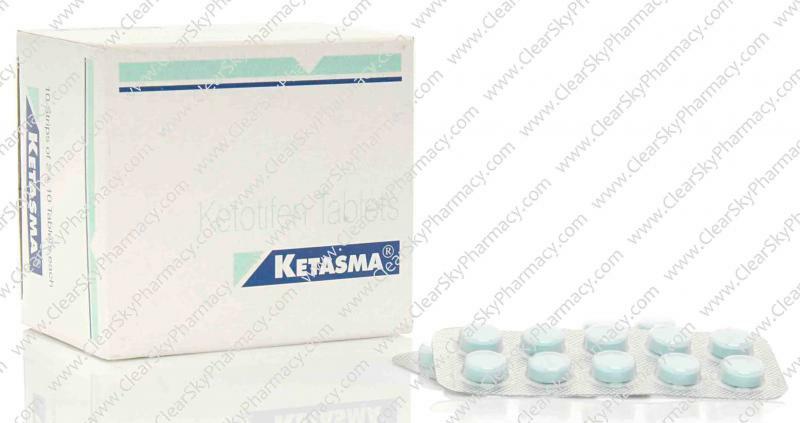 The active ingredient present in Ketasma tablets is Ketotifen Fumarate. Each tablet of contains 1 mg of Ketotifen. Generic Zaditen (Ketotifen Fumarate tablets) is used to treat itching of the eyes caused by allergy to dust, pollen, animals, as well as bronchial asthma or other allergens. Ketasma is an antihistamine that inhibits the body's release of a chemical called histamine. Histamine can produce allergy symptoms such as sneezing, runny nose, and watery eyes. Swallow Ketasma tablets with a drink of water. Take them at the same time as you are having your meals. The usual dose is 1 or 2 mg (1 or 2 tablets) twice a day. The usual dose is 1 mg (1 tablet) twice a day. Generic Zaditen Tablets should not be given to children under 3 years of age. Your doctor may decide to start with a lower dose. Patients known to be easily sedated should be given 0.5 mg to 1 mg at night for the first few days. The common side effects of Ketotifen (Ketasma tablets) occuring in up to 1 in 10 people are feeling hyperactive, irritable or nervous and disturbed sleep. Other side effects of Ketotifen tablets include drowsiness and, in isolated cases, dry mouth and slight dizziness may occur at the beginning of treatment, but usually disappear spontaneously after a few days. Occasionally symptoms of CNS stimulation have been observed. Weight gain has been reported. Cystitis has been rarely described in association with this medicine. Isolated cases of severe skin reactions (erythema multiforme, Stevens-Johnson syndrome) have been reported. The reported features of overdose include confusion, drowsiness, nystagmus, headache, disorientation, tachycardia, hypotension, reversible coma; especially in children, hyperexcitability or convulsions. Bradycardia and respiratory depression should be watched for. Elimination of the drug with gastric lavage or emesis is recommended. Otherwise, general supportive treatment is all that is required. Post-marketing surveillance has shown exacerbation of asthma in approximately 2 per 1000 patients. Since some of these asthmatic attacks might have been related to stopping existing treatment it is important to continue such treatment for a minimum of 2 weeks after starting this medicine. This applies especially to systemic corticosteroids and ACTH because of the possible existence of adrenocortical insufficiency in steroid dependent patients: in such cases recovery of a normal pituitary-adrenal response to stress may take up to one year. If it is necessary to withdraw this medicine this should be done progressively over a period of 2 to 4 weeks. Symptoms of asthma may recur. If intercurrent infection occurs, this medicine treatment must be supplemented by specific antimicrobial therapy. This medicine may potentiate the effects of sedatives, hypnotics, antihistamines and alcohol. Patients should be warned not to take charge of vehicles or machinery until the effect of this medicine treatment on the individual is known. A reversible fall in the thrombocyte count in patients receiving this medicine concomitantly with oral anti-diabetic agents has been observed in a few cases. This combination of drugs should therefore be avoided until this phenomenon has been satisfactorily explained. During the first few days of treatment with this medicine reactions may be impaired. Patients should be warned not to take charge of vehicles or machinery until the effect of This medicine treatment on the individual is known. The effects of alcohol can be increased by Generic Zaditen Tablets. You are strongly advised not to drink alcohol when you are taking Ketasma tablets. The safety of Ketotifen tablets for use during pregnancy has not been established. Although there is no evidence of any teratogenic effect, it is not recommended for women who are pregnant. Ketasma tablets should not be given to pregnant women except if clearly needed and the benefits outweigh the potential risks. Ketotifen has been found to be excreted in rat milk. While there are no human data available, it is likely that Zaditen is also excreted in human breast milk, and therefore, mothers receiving Generic Zaditen should not breastfeed. Generic Zaditen iscontraindicated in patients with a hypersensitivity to ketotifen or to any of the inactive ingredients present in Ketasma tablets. This medication is also containdicated in persons with Epilepsy or history of seizures. You can buy Generic Zaditen tablets online from Clear Sky Pharmacy at a cheap price. Ketasma 1 mg pills, manufactured by Sun Pharmaceutical Industries Ltd., India are supplied in a blister strip of 10 tablets. The 1 mg tablets cost only $0.25 per unit when you place an order for 240 tablets.